Team pictures will be taken Sunday morning for baseball K to AAA and all of softball. NB&S sponsors receive a team photo and plaque as a thank you for their support. Team photos are a gift to all players; however, individual photos may be purchased. Manager/Coach will have team's assigned time. Route to DeFazio Park - Great Plain, Fair Oaks, and Dedham Ave.
Only coaches and players will be allowed on the field. Parking is available at DeFazio, the DPW and Pollard School. Do not park along Dedham Ave or adjacent side streets. The ceremony kickoffs with reciting the Little League Pledge and the Pledge of Allegiance. Needham Community Theatre member Cathy Merlo will sign our National Anthem. NB&S Vice President will present the Bergin Award and Windhorst Award scholarship winners. Our special guest will give a short inspirational speech while Wally the Green Monster cheers for all. Our special guest along with NHS softball & baseball captains will throw the first pitch. Please encourage your team to attend a game. Rocket Travel vs. Noreasters at Warner Field 9 & 11:30 a.m.
All teams will be given hotdogs courtesy of Roche Brothers and NB&S is providing water. Players and families may participate in the activities hosted by some of our sponsors. · The Village Club will run the Pitch, Hit, and Run activity courtesy of Smile Boston. *Advance registration HERE. Do not bring cleats or equipment to the parade. Dogs are NOT allowed at DeFazio Park except for service dogs. Please review this link and be safe when driving through the DeFazio parking lot. Only players and coaches will be allowed to sit around the perimeter of the infield. Parents may watch from behind ALL of the players or fence. Players will stay with the coaches as the teams are dismissed. Only one coach or designated person from each team is permitted to pick up the hotdogs and water. A limited number of turkey and kosher hotdogs will be available - please have the coach get it. Please identify a meeting spot for your child after the ceremony so you can safely reconnect. Teams and families are responsible for trash. 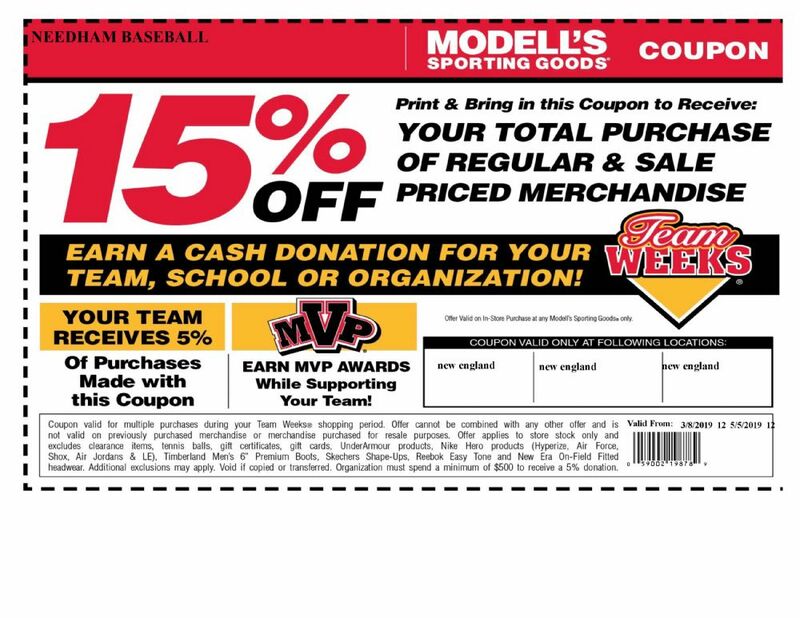 Modell's is offerring a 15% Discount on New and Sale items now through May 5th.